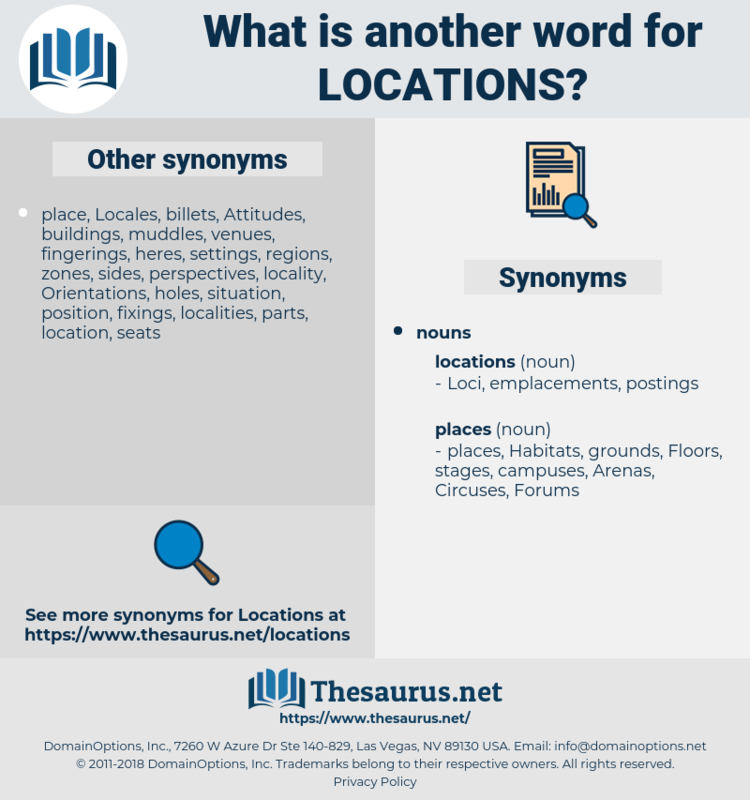 What is another word for locations? site, sites, venue, venues, situation, situations, destination, destinations. allocations, directions, Locales, implantations, whereabouts, centers, Loci, terminals, jobs, crossings, spaces, sides, site, sites, place, places, venue, venues, campsites, situations, destinations. 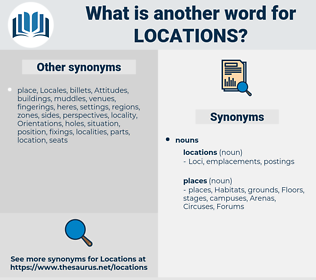 institutions, administrations, headquarters, establishments, settlements, Plants, itpos, homes, Institutes, developments, PAGES, boards, officers, locators. accommodation, accommodations, sections, regionally, within, directory, things, milestone, autonomous, Polling, localization, relevant, belonging, relics, buildings, soil, matters, silo, silos, N, issues, transfers, reporting, community-based, training, brazilian, toronto, governed, mosques, elevator, Elevators, subject, themes, canadian, indian, related, church, boards, marks, dot, officers, score, Les, under, locating, position, positions, positioning. attractions, installations, neighbourhoods, implementations, indications, airports, surroundings, jurisdictions, institutions, distribution, distributions, designations, Occupations, complainants, organisations, Populations, Organizations, applicants, reservations, directorates, Publications, Photographing, lots, Neighborhoods, Co-ordinates, corporations, claimants, introductions, amenities, headquarters, options, portions, residences, coordinates, standpoints, delegations, hotels, contacts, scenarios, emplacements, Cities, rooms, mentions, establishments, Originating, facilitates, seats, flashpoints, provenances, strongholds, topics, workstations, particulars, available, clinics, instances, checkpoints, channel, enclaves, contexts, purposes, stances, limits, villages, vulnerabilities, landscapes, Municipalities, Habitats, channels, viewpoints, settlements, installs, Periodicals, Prisons, affiliates, garrisons, methodologies, operations, terrains, depositions, perspectives, Sanctities, assignments, Penitentiaries, Plants, Colonies, provinces, stops, place-names, Beneficiaries, trails, references, lands, zone, zones, districts, oblasts, views, Angles, encampments, Missions, Foundations, precincts, domicile, walks, altitudes, aspects, compartments, access, worlds, contracts, corners, liabilities, retailers, fields, Hospitals, immovables, townships, Opportunities, subparagraphs, objects, Los, components, occurrences, seasons, occasions, counterparts, Possibilities, enclosures, Appointments, presence, presences, subregions, materials, names, cinemas, elements, filming, repositories, landmarks, coordinated, distributors, slots, audiences, recipients, deployments, landlords, losses, resorts, structures, depots, consignees, sights, courses, outposts, Warehouses, directives, opinions, benchmarks, linkages, grassroots, heading, headings, species, Tracks, Stipulated, broadcasters, targets, routes, Entities, PROSPECTS, divisions, throughout, ways, stitches, questions, surfaces, addressees, CAMPS, postings, IMMEUBLES, appellants, stocks, Counties, chains, Companies, halls, address, Addresses, supports, accommodations, FORMATS, campuses, Branches, shelters, antennas, homes, pictures, signatories, seaports, origins, Factories, havens, professionals, outlets, Records, sources, theatres, organs, plots, platforms, mills, endorsements, Attitudes, approaches, acts, blocks, Territories, circles, resellers, assets, insights, hubs, landfills, harbours, credits, avenues, holdings, towels, providers, suppliers, owners, Arenas, web-sites, fronts, planned, cites, hotspots, organisms, landowners, waters, Worksites, services, NODES, visitors, supporters, scenes, backgrounds, roads, magistrates, shrines, mistakes, Paths, guerrillas, mandates, Patches, briefings, clauses, months, tours, stands, petitioners, ranges, fates, Envisaged, Floors, circuits, Vacancies, Cells, Carriers, earnings, finds, Databases, bullets, classrooms, enterprises, farms, stages, villes, coaches, signers, chairs, laws, lengths, showings, peoples, courts, Houses, polls, Filings, numbers, aerials, segments, concerns, compounds, Storerooms, tickets, monitor, streets, dealers, streams, vessels, deposits, Undertakings, boutiques, homepages, squares, developments, Schools, sampled, Entries, Dependencies, colleges, subjects, passages, respects, Economies, searches, Vendors, tasks, Roles, Countries, Soldiers, Properties, Postures, units, sub-items, levels, troops, departments, Boundaries, Industries, sub-offices, hits, receivers, statutes, outdoor, everywhere, utilities, Ideas, communes, spheres, sectors, flights, Assemblies, Subsidiaries, Ships, Destinies, practices, homeowners, affairs, errors, digits, Universities, dishes, reserves, hot, markets, samples, usages, features, Forums, Fora, Ones, relays, bearings, Gases, periods, engines, Magazines, frameworks, crops, ministries, exchanges, cases, PAGES, Benches, dots, shifts, chambers, pockets, scores, Bodies, wards, results, Bases, Boxes, uses, covers, runways, Firms, Businesses, phrases, reserve, yards, counts, dumping, ties, wide, bushes, shops, breaks, Programs, leads, media, AIRES, Sports, trades, PTS, Parties, works, Forms, Lives, Workshops, Guns, runs, sections, meetings, 1999, LINEs, things, S, buildings, sheds, matters, issues, transfers, themes, boards, marks, officers, locators. locality, localities, place, places, placement, locator, locators, rentals, lease. Geographies, projects, stores, rents, rental, localities, rentals. The conditions and locations of the proposed new grant of Sackville were of the first interest to the newly arrived settlers, and the proceedings were largely taken up with settling such matters. That's why no one had filed on the locations before. locution, lectin, liquidation, Lucy Stone, leukotomy, lockdown, lusitania, less than, lighten, lusatian, lagodon, lusitanian, liston, lygodium, last name, lasthenia, lagidium, lactation, listen, ligation, lecithin, lewiston, light time, listen in, laughton, lookout man, laxation, look down on, legation, leucotomy, Lake Tana, light within, luxation, look out on, lookdown, lysichitum, loxitane, lysichiton.